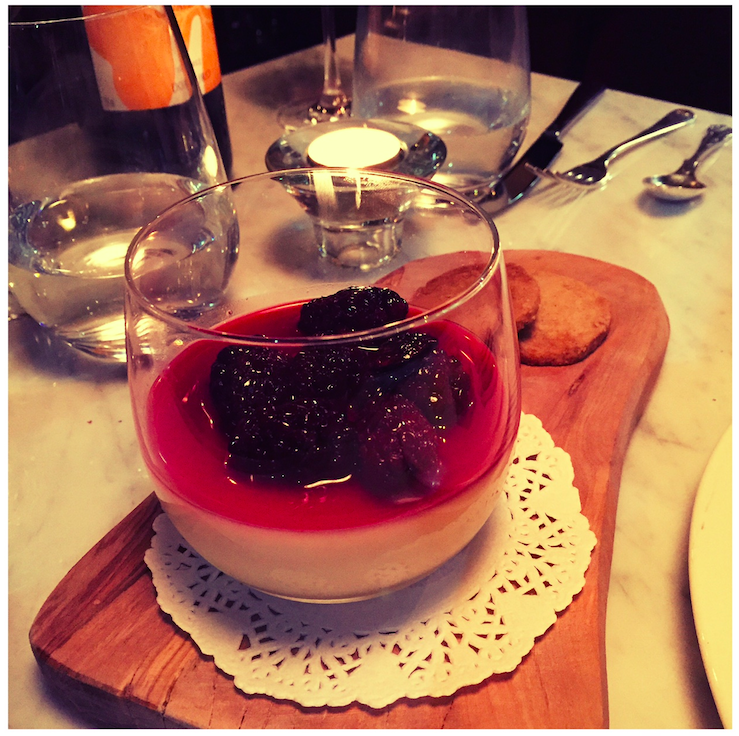 Over the festive season, lots of people asked me what had been my favourite restaurant of 2014. 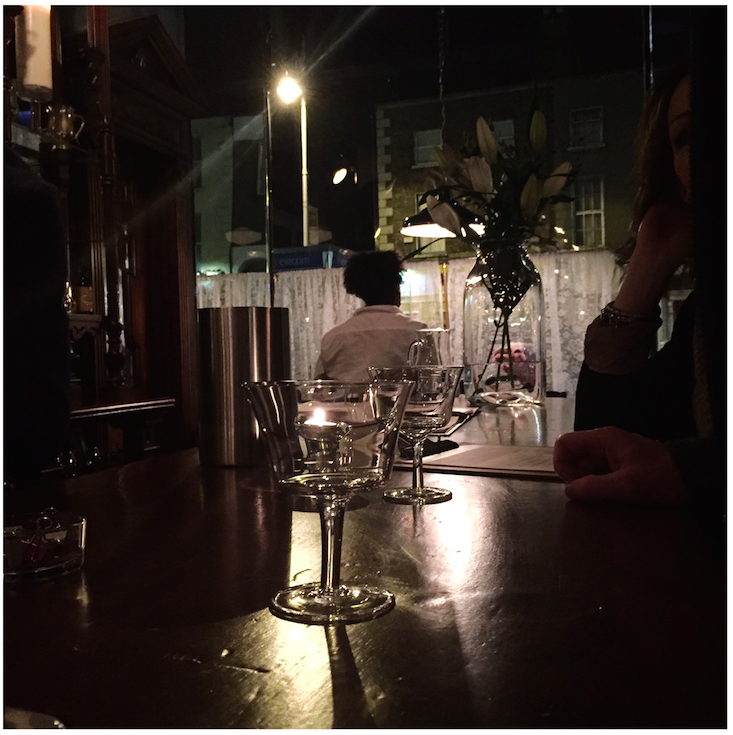 I can tell you now, that my best Dublin restaurant of the year only stole into that place in the dying days of December, when I first walked into Delahunt on Camden Street. I liked it so much that I ended up eating there twice in the same week. The first visit was on the invitation of two friends who are further ahead of the curve than me, and had chosen Delahunt as the venue for the annual celebration of their wedding anniversary. I was mostly just excited to eat anything that didn’t have turkey or ham as the primary ingredient. But I began to get properly excited when we walked through the doors of Delahunt and took in the view. The whole place feels like a labour of love. Carvills’ old wooden off-licence counter has been kept and restored in all its glory, and now serves as a long wooden bar which runs half the length of the restaurant and immediately invites you to pull up a seat and have a cocktail. The old floorboards (I remember almost falling through a hole in one of them while on a closing-time mission to pick up a bottle of wine, some years ago) have also been kept and restored and this all gives the place a stylish, but lived-in feel. Every corner has been thoughtfully curated, right down to the prints on the walls in the snug and the framed sketches lining the walls in the bathrooms. The net curtains on the windows give it an “Auld Dublin meets NYC” feel. It doesn’t feel like a brand-new restaurant at all. As we were still waiting for some of our group to join us, we duly pulled up a couple of stools at the bar and ordered a drink. 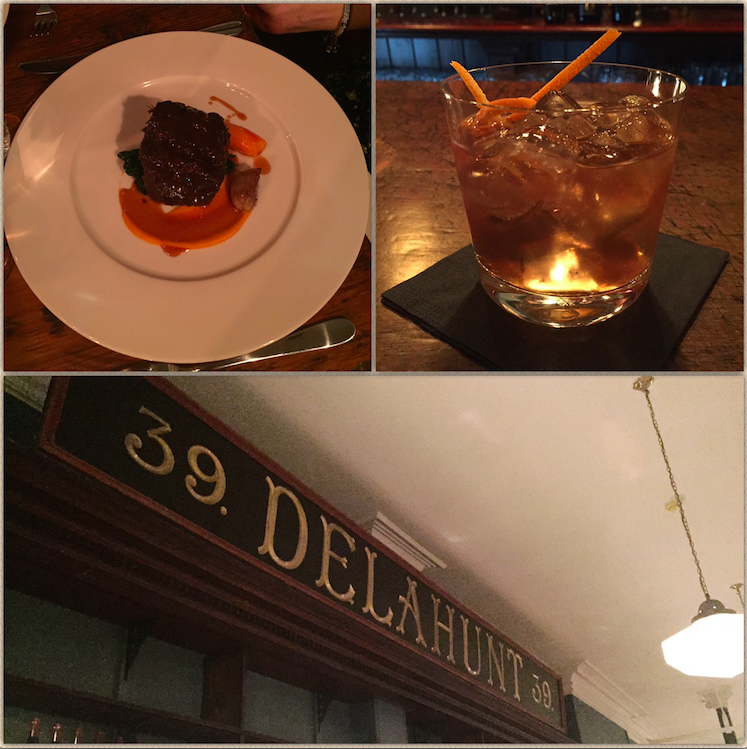 We chatted to the unassuming young chap behind the bar, and fished to find out a bit more about Delahunt’s back-story. As it turned out, the “barman” himself was the owner (Darren is his name), who has bravely bought the whole building from NAMA. With a background in some top Dublin dining haunts, and ambitious plans researched by visits to London and New York, he’s brought two chefs from Locks with him to Delahunt and his plans for the place include expanding upstairs with more seating and I think, another bar. The name “Delahunt” came from the old name of the premises before it was Carvill’s, discovered on a sign they found during the renovations and which now hangs on the wall in the restaurant. Needless to say, by this stage we were only dying to sample the food. The rest of our gang having arrived, we were delighted to be shown to the “snug” at the back – a glass (and more net curtains)-enclosed private dining room which looked to be an original feature of the building. It holds a table that can snugly fit 8-10 people and from where you can still see out to the rest of the restaurant and into the kitchen – very important for nosey parkers like me. We took our seats and imagined old Mr Carvill or his book-keeper doing the paperwork here back in the day. The menu was simple – 4 starters and 4 mains, with starters from €7-10 and mains from €18 up to around the €25 mark. The great thing about us being a big group was that we got to see and sample everything from the menu. I was thrilled with the presentation of my Jerusalem artichoke soup, which was poured into the bowl at the table on top of some tiny mushrooms, and served with a wooden board on the side on which was presented my “mushrooms on toast” with hazelnut pesto. I thought €7 was amazing value for a dish that had so much taste and theatre. The other starters around the table were going down well too, especially the popular “Crispy pressed ham hock & crubeens, celeriac remoulade, raisin mustard,” which although was described as looking like “a fish finger” defied all criticism once you tasted it. I also loved the pear & Bellingham blue cheese salad with chicory, sherry and walnut and it was this one that I ordered the next time I visited. Finally, the Home Smoked Salmon, with Guinness bread, horseradish and cucumber, was served sashimi-style on a black slate and accompanied by some very good Guinness bread. We’d also received some of the same bread in the excellent bread basket that had been delivered to us earlier on, so everyone got to tuck in. 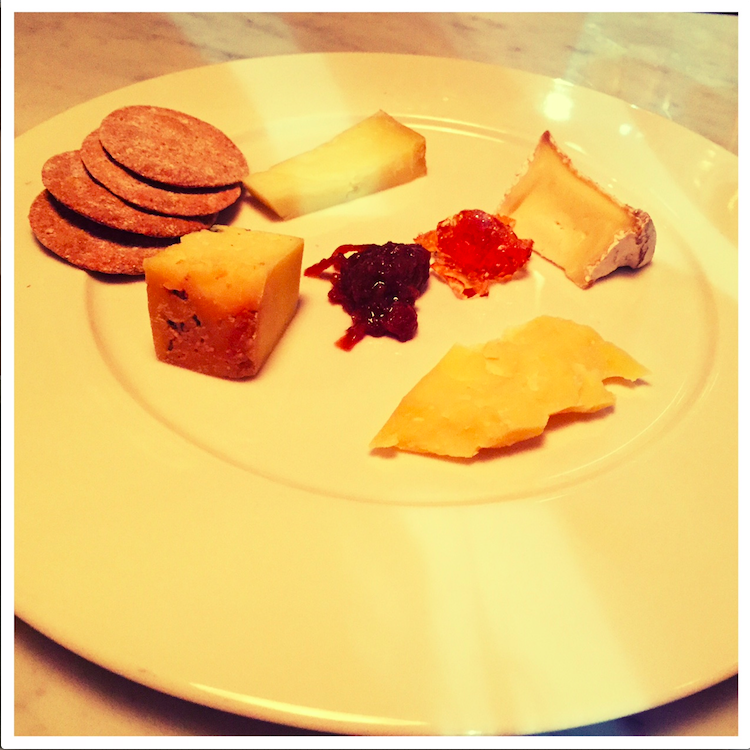 The standard continued through to our main courses. The star of the show was the “Beef cheek braised in stout, glazed carrot, black cabbage horseradish, smoked bone marrow,” a perfect winter dish with slow-cooked beef that fell off the fork (and into our gobs). The hake in my “Roast hake with red wine & beetroot braised lentils, leek, Lardo di Colonnata” had been replaced with plaice – a lovely piece of fish and a great dish, but I definitely felt it would have been better with hake or even a meaty piece of cod. The other main course that was the envy of all but the two people who’d ordered it, suprisingly was the vegetarian one. 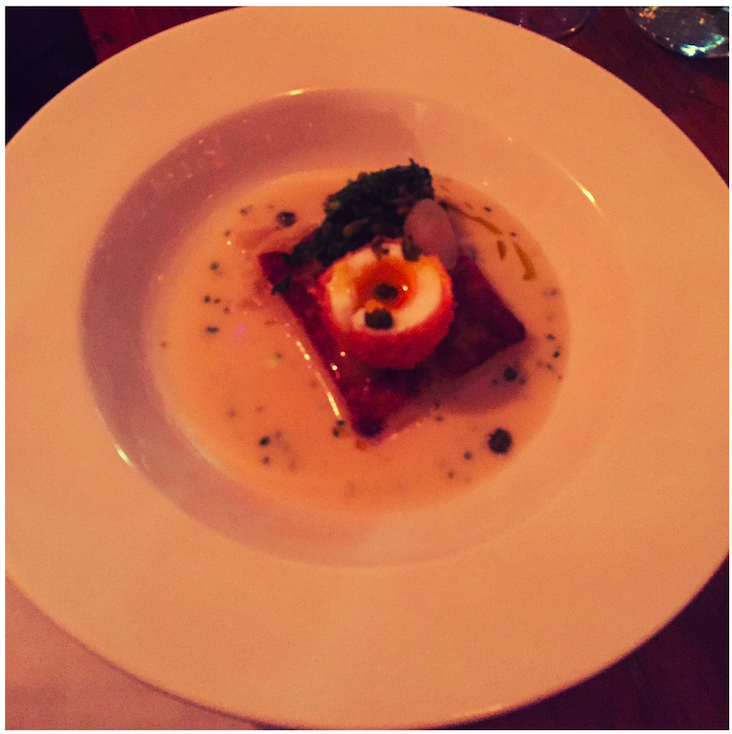 A potato cake topped with a crisp hen’s egg and served with curly kale, capers and white onions, it was another stunning winter warmer. The level of presentation of each dish was fantastic, and the portions were perfectly judged. We also got to sample all of the side orders, including roast potatoes, an amazing swede mash, and (I surprised myself in my post-Christmas state, by scoffing quite an amount of this) brussels sprouts and chestnuts. The wine and drinks lists are excellent – sure they’d have to be, to avoid the ghosts of the building’s previous owner coming back to haunt them. We enjoyed our red wine, a “Quadrifolia” Douro from Portugal (€34) so much that I ordered it again on my second visit. We also had a lovely “La Closerie” Chardonnay, great value at €26, so you can down it guilt-free. The lads also sang the praises of the Whiskey Sours and the Maple Old Fashioned, and I can back up the latter as the beautifully made Old-Fashioned in the photo at the top of the post was the one I enjoyed all to myself when I came back a few nights later. I decided I didn’t have room for dessert, but asked if I could order an Irish coffee instead. Once the rest of the table got wind of this idea, the staff found themselves with an order for five Irish coffees on their hands, which they obligingly whipped up even though they hadn’t been on the menu. The Irish coffees washed down a selection of superb desserts including a Rhubarb Fool with Leinster sugar cake (that’s biscuits to you and me) and a very sinful warm chocolate pudding that had everyone else sneaking spoonfuls of it around the table. Ain’t no fool like a rhubarb fool. When finally we had finished polishing off this feast of food and drink, we realised we were the last people in the restaurant, so sadly decided we’d probably have to move on. Here has to be given an honourable mention for all of the staff, at one point all of whom were with us in the snug, as they teamed up to make sure that all of our dishes were served up at exactly the same time and to the right recipients. They all really knew their stuff, were great fun without being intrusive, and added to the overall banter of our evening (special mention to Rita who I met on my second visit – she is a legend). We were a bit scared of what damage we might have done to the bill at the end of the evening, but were pleasantly surprised when it arrived, as we all considered a total of about €80 per head including service very fair value for the level of food, drink and overall experience we’d enjoyed. 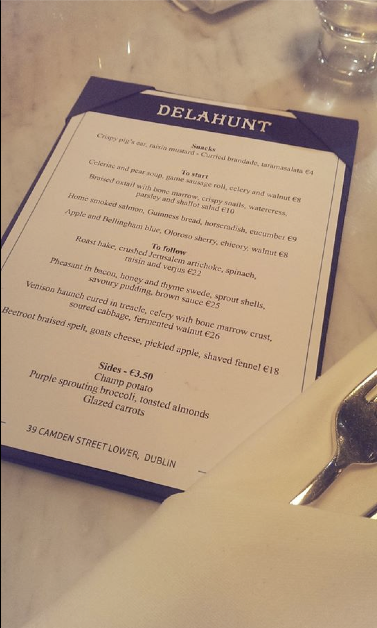 Delahunt is elegant, but casual, and to be able to eat this standard of food in a relaxed, buzzing environment is something new and very much welcome in Dublin. I’m even OK with the unisex toilets here (usually a pet hate – see Super Miss Sue) because they’ve kept them as individual, self-contained bathrooms. I think Delahunt is going to become very, very popular in Dublin and although selfishly, I’d love to keep it on the down-low, it absolutely deserves to be. In keeping with Delahunt’s understated style, it’s been launched without PR “buzz” (which can often lead to overpromising and underdelivering – take note, The Dean). But, it’s building that buzz all by itself, and quietly packing them in every evening that I’ve passed since. They’ve just changed the menu and added some new dishes, so don’t wait until 2015 is too much older before you pay this place a visit. Oh, and if you’re a group of 2-4 people, or you’re looking to impress your date, ask for the window table – it’s the best seat in the house. 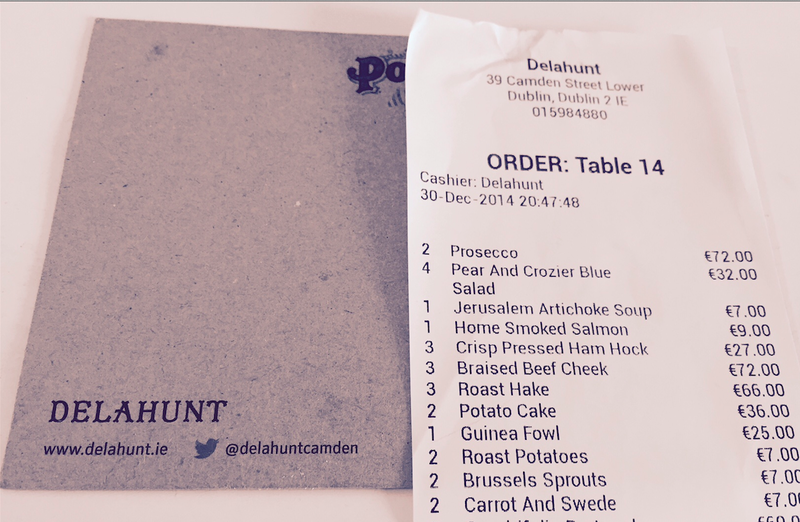 Delahunt, 39 Camden Street Lower, Dublin 2. Tel: +353 1 598 4880, visit their website or Facebook page.